They are sent to the world's hot spots-on covert missions fraught with danger. They are called on to perform at the peak of their physical and mental capabilities, primed for combat and surveillance, yet ready to pitch in with disaster relief operations. They are the Army's Special Forces Groups. 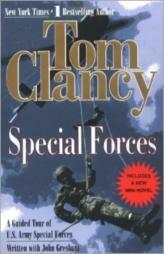 Now follow Tom Clancy as he delves into the training and tools, missions and mindset of these elite operatives.